Apian imagery from Greek and Roman mythology reveals a belief that bees routinely traveled between human and divine realms. 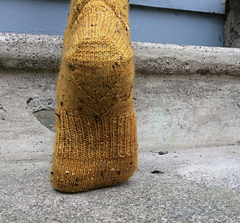 Today, we continue to be fascinated—even mystified—by bees. 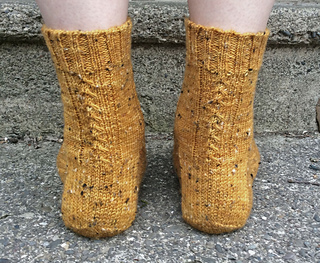 These socks are a knitted tribute to the small but mighty pollinators that do important work on our planet. Your pattern purchase helps to support Heifer International’s endeavor to supply honeybees to farmers in agrarian communities. 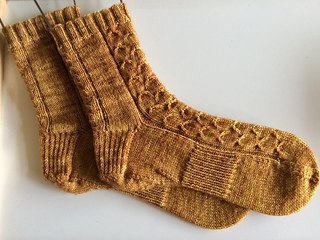 Humblebee socks will keep you humming as you knit a simple cabled texture on the front and a charming column of bees on the back. 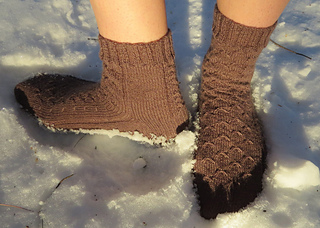 This pattern includes several techniques for a secure heel fit and a ribbed band at the arch to keep your feet feeling energized all day. Your pattern purchase will benefit Heifer International. To date, we have been able to contribute funds for 13 gifts of honeybees!